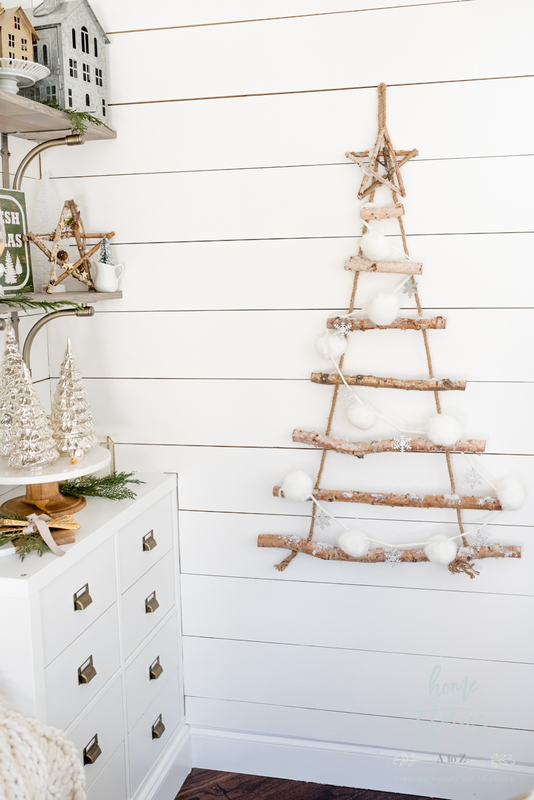 Implement these quick tips on how to affordably decorate Christmas shelves using products from Walmart. 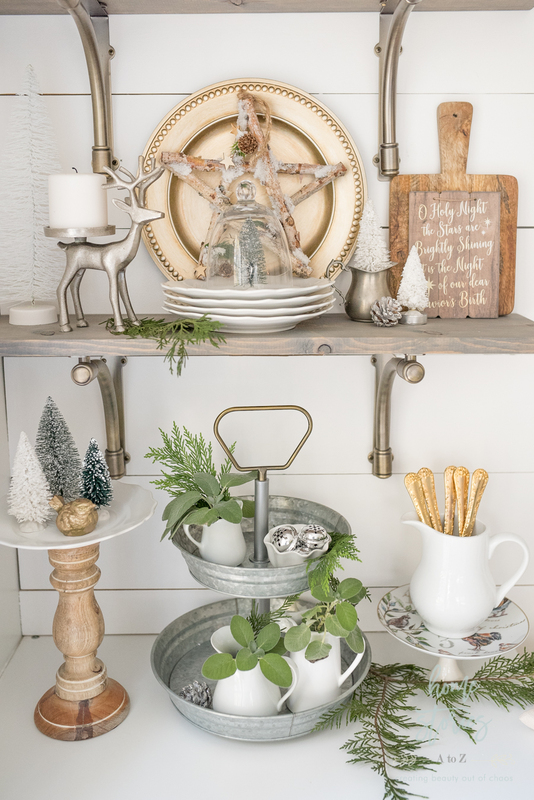 Create a beautiful farmhouse Christmas look that doesn’t break the bank! This post is sponsored by Walmart.com. All opinions on the cute and affordable products are my own. This post contains affiliate links for your convenience and to help support my blog. Thanks for purchasing items that catch your eye through my links! Most of the items pictured were purchased at WalMart.com, or at Walmart in-store. For reference, please take note of the picture below. Everything that has a white tag on it was purchased either online, or in-store at Walmart! All of the details and source links for Walmart products can be found within my post. Let me know in the comments if you’re having trouble finding an item, and I’ll do my best to help if I can! Tip 1: Know where to shop to find affordable Christmas decor. It’s that time of year again—the most wonderful time of the year! 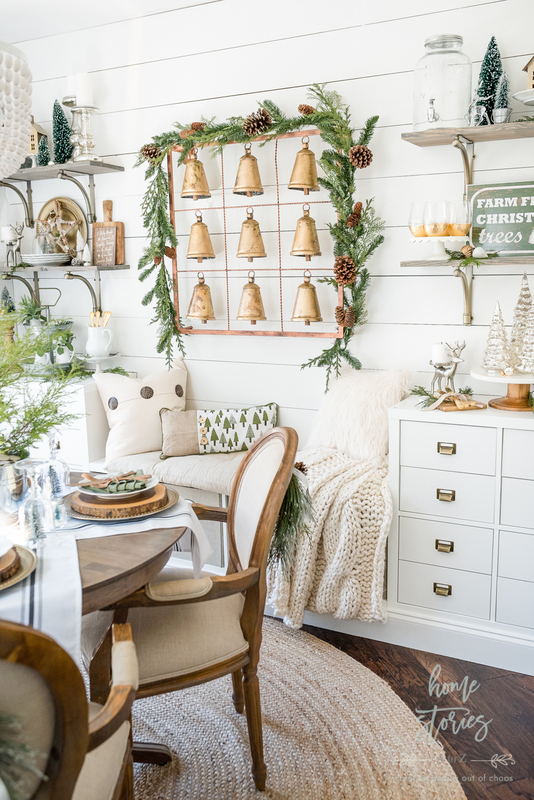 It’s time to deck the halls and bring some Christmas cheer to each room in your home. 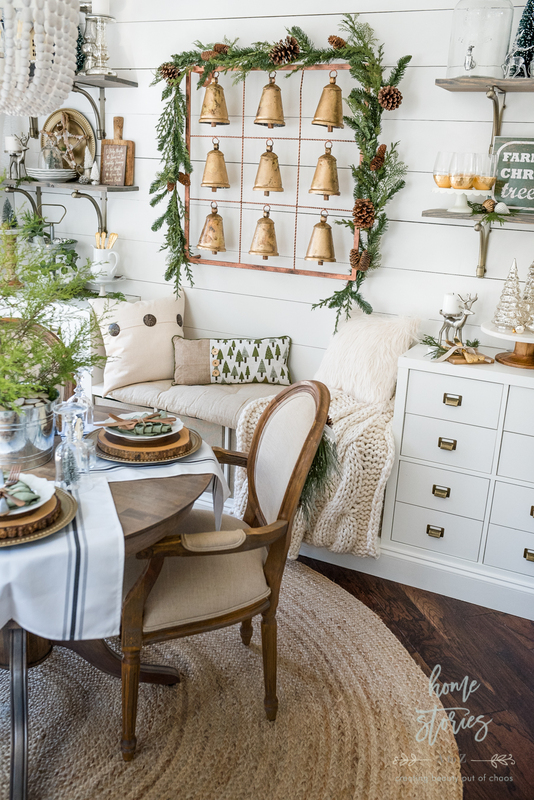 Christmastime can be spendy, but your decor doesn’t have to cost a fortune to look beautiful! 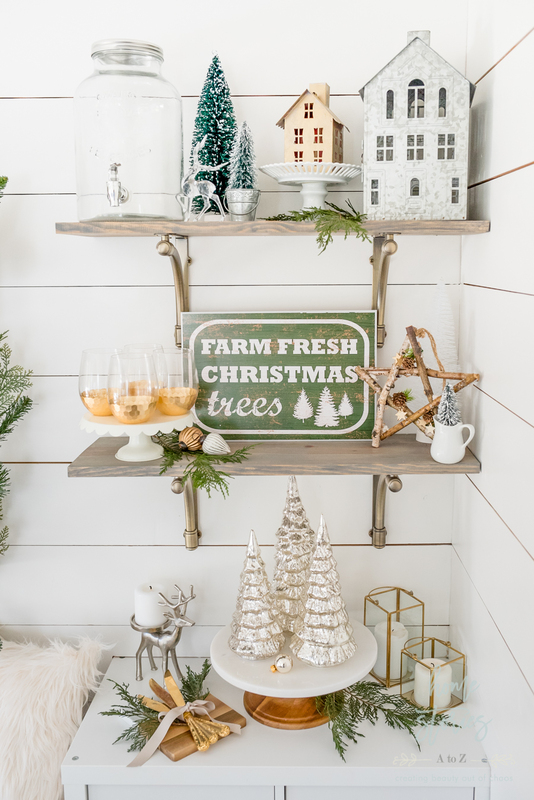 Today I’m sharing my insider tips on how to affordably style shelves for Christmas using products almost exclusively found on Walmart.com. If you haven’t shopped Walmart.com before, then you’re in for a treat! 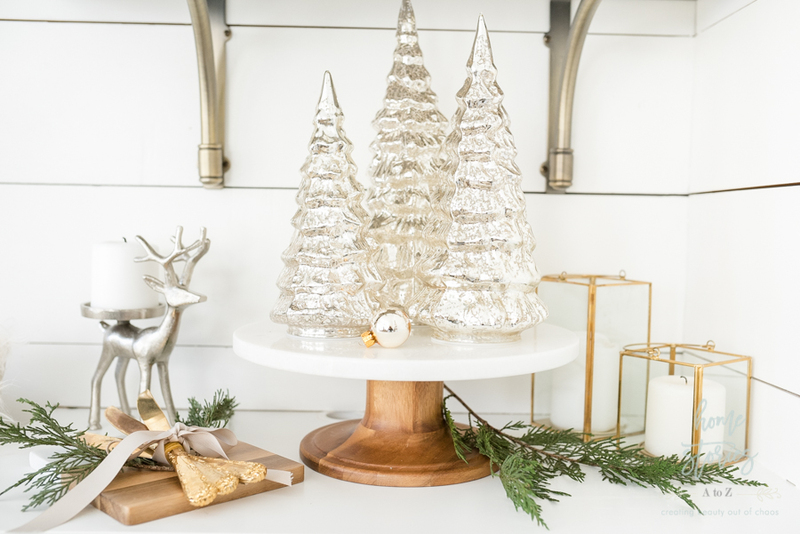 Walmart.com offers a fabulous selection of stylish, affordable, and quality Christmas items, many of which come with free 2-day shipping on orders over $35—no membership fees required. I buy most of my Walmart items on Walmart.com, and I shop by style which allows me to find exactly what I’m looking for quickly and easily. (Pssst. 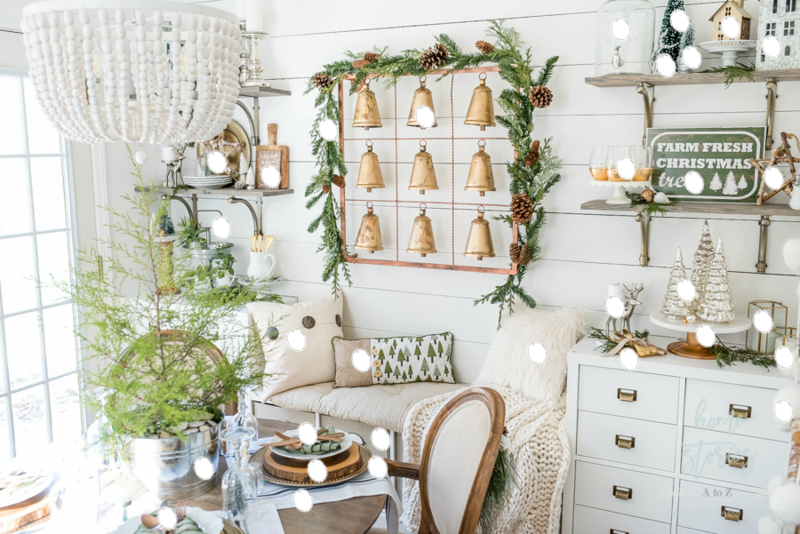 Click here to check out the brand Belham Living for some gorgeous farmhouse Christmas items I think you’ll adore!) I can also shop online and pick up in store today for items I need immediately. I highly recommend giving Walmart.com a try. I think you’ll be pleasantly surprised at what you find! Tip 2: Purchase items within a similar theme and color palette. When I order items for styling a particular space, I don’t always know ahead of time exactly how I will be using those items within the space. I choose items within a tight color palette–in this case green, white, gold, and silver–that I know will work well together and go from there! Choosing decor within a tight color palette always you to effortlessly pull together a cohesive look. 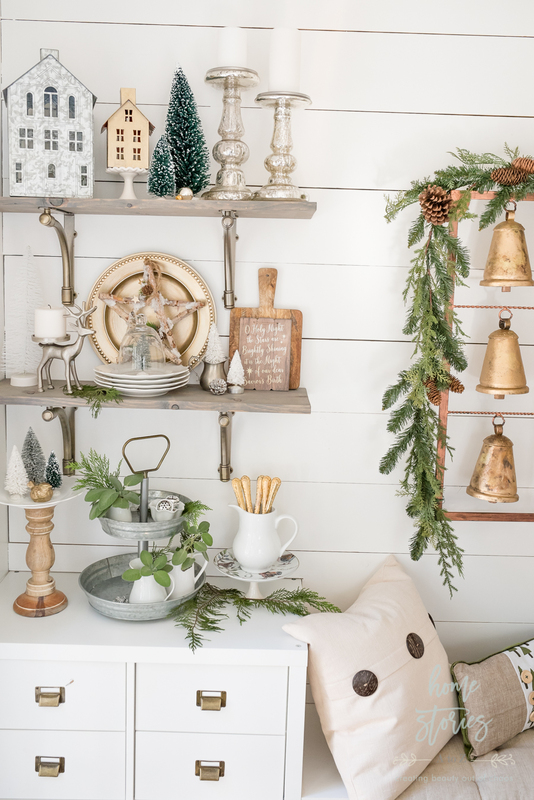 Tip 3: Begin styling your largest items first. I always like to have my large focal point items in place in the room first. For example, put up your wall art, mirrors, Christmas trees, etc first in order to ground the space and inspire the rest of your decor placement. 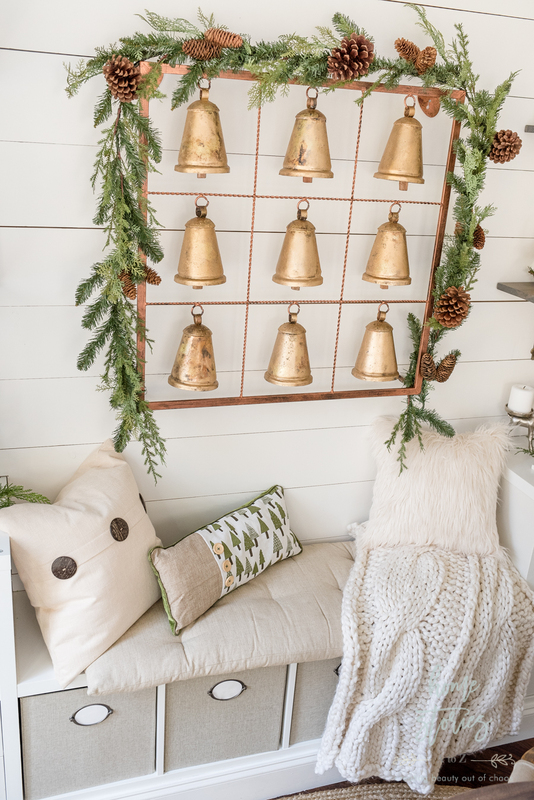 The first item I hung in the room was this gorgeous Metal Bell Square Wall Plaque. It’s so unique and lovely and the bells actually ring! You can shop it here. 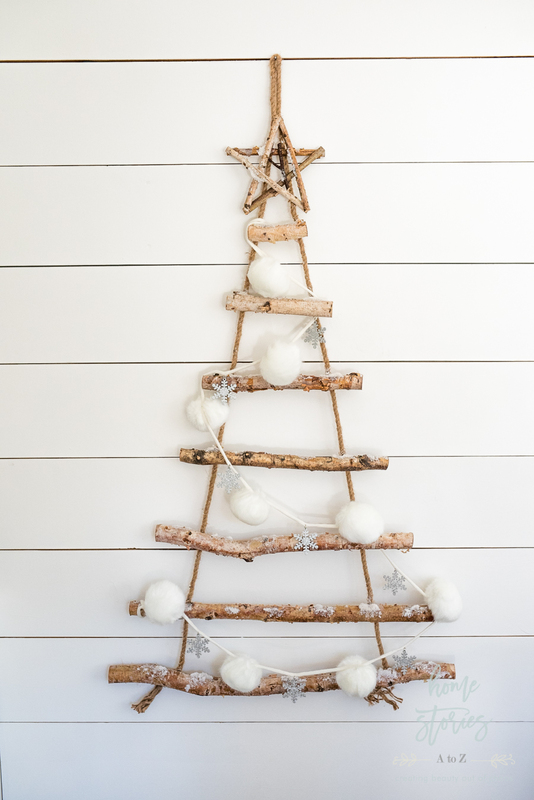 Next, I hung this adorable Birch Twig Wall Christmas Tree and topped it off with a cute White Pom Pom Garland from Belham Living. This tree would look so cute with a bunch of presents underneath it. I also set up this gorgeous flocked Christmas tree in the corner of the room which is a steal priced at only $79! It’s fabulous, fluffy, and fully flocked. Tip 4: Begin placing items on your shelves, paying attention to height and symmetry. 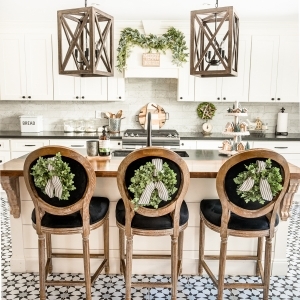 I love symmetry when styling! If I place a large object on one side of the shelf, I typically try and balance it with an object of equal height on the opposite side of the shelf. Each individual shelf should tell it’s own story and create a beautiful vignette within the larger picture. I love my new battery operated mercury glass trees! They light up at night and have a timer setting, so I don’t have to worry about turning them off each evening. Find them here. Tip 5: Create “visual triangles” on your shelves by placing like-colored objects in a zigzag pattern. Staggering the objects on your shelves in a way that keeps the eye moving is visually pleasing. You’ll notice on my shelves that I use gold, silver, white and green but I stagger the colors on each shelf. For example, if you were to draw imaginary lines on the picture below between all of the silver objects you would see that they create visual triangles. Also don’t be scared to make your objects your own! I found the cute small houses in-store at Walmart but it was originally red and I wanted silver or gold. I painted them gold to better fit my needs. 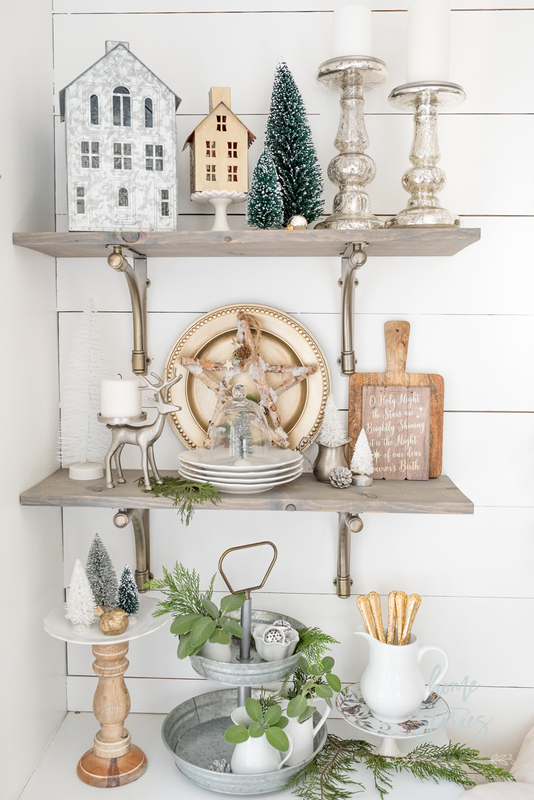 Thanks so much for stopping by the blog to take a look at my shelf-styling tips! Let me know in the comments if you have any questions. You can see more of my daily behind the scenes on how I create these spaces by following me on Instagram. I’d love to connect with you over there! 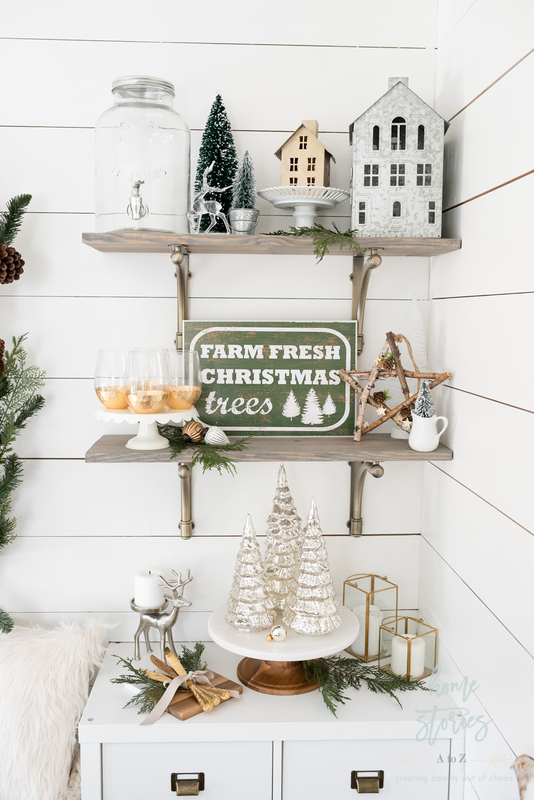 You might also like my related post: Simple Farmhouse Christmas Table: Tips on Creating an Adorable and Affordable Christmas Table!